It was a very pleasant day. Crowne Plaza in electronic City was teeming with life. 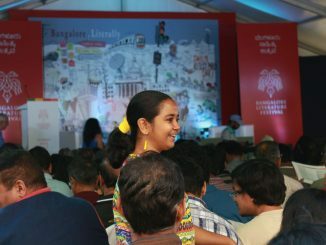 The first day of the Bangalore Literature Festival had kick-started. Unsurprisingly, Friday saw the smallest attendance due to it being a work day. The line-up for Friday’s panels featured a variety of famous faces ranging from Sri Sri Ravishankar and TV Mohandas Pai to Farhan Akhtar. Being the first day of the Literature Festival, I had made the decision to meander between talks. At first it had seemed like a smart idea. I thought it would allow me to get a feel of the event as a whole. I regretted it soon enough. Weaving in and out of talks prevented me from really experiencing their essence. Leaving a talk mid-way meant that I had not fully appreciated the ideas the panellists were developing. Walking into another session at the start of the question and answer session saw me wear a clueless look since I had missed out on the entire point of the discussion in the first place. The only positive to really come out of my wandering take on the festival was the opportunity I had to talk to other people even if it was mostly to apologise for clumsily bumping into them. On the second day, I really got a chance to communicate with a few people. Following the path that was lined with food stalls selling chaat, crepes and other snacks, I finally happened to visit the Makkala Koota midway through the Japanese folktale session. The storyteller, donning bright red devil horns, animatedly spoke into the microphone. “Can you please laugh like a witch?” she asked, aiming the microphone at excited children who laughed maniacally, some even slightly scaring those around them (including me). As she slowly moved towards the adults, presumably parents, at the back to get them involved, I had decided it was may be time to head to the panel discussion that I had intended on finally sitting through from start to finish. The ‘Endangered Gender’ talk at Mysore Park consisted of Shobhaa De, Kishwar Desai and Gita Aravamudan. Considering the slew of tragedies that shocks the nation on a daily basis, this talk was extremely relevant. From the writers’ insightful words to Shobhaa De’s natural sense of humour, it proved to be a very stimulating panel discussion to have witnessed. The discussion began with the obvious statement of our society being a patriarchal one and where “the birth of a girl child is mourned” as Shobhaa De rightly said. Kishwar Desai then moved on to point out that this patriarchal view is more universal than we would have been led to believe. This was rounded off with Gita Aravamudan filling the audience in with personal stories she had heard while researching for her book, Disappearing Daughters. “The reason why everybody came out on the streets was because it directly threatened them, their daughters, their neighbours and their colleagues… Had she not been representative of the ambitious middle class, we would not have been in those kind of numbers,” Shobhaa De moved on to say in relation to the nation’s overwhelming response to the Nirbhaya case. The entire discussion provided an amazing insight into these empowered women’s view of the situation in the nation as a whole. The next day, the venue was heaving. As I walked in, a school bus was pulling out of the entrance. The excited school children stood in lines that were askew and vivaciously chatted while the teachers tried their hardest to get their attention. I was not sure how I had missed this on Friday. While walking towards the Makkala Koota once more I noticed white cloth hanging from wires. They had pockets at the base to place postcards. Each card had a different word such as ‘Read’ and ‘Write’ and messages from various attendees to be a part of an art installation by Kumar La Noce. Numerous clothes were strewn across the lawn and were gently swaying with the wind. Children were running in between them while many a child and adult stopped to read the contents of these postcards. These cards were a part of a contest where the three winners won a brunch at the Crowne Plaza Hotel. Perhaps the most intriguing panel, in my opinion, on Saturday was The South Asian Voice: Are We Writing for Ourselves? The panel featured a mix of South Asians – Kanak Dixit, Ashok Ferry, Farah Guznavi, Mira Hashmi and Babar Ayaz whose book, What’s Wrong With Pakistan, was launched at the event. The discussion revolved around the very idea if writers were focussed on a foreign audience or a South Asian one. Gulzar, the famous poet, found himself playing a role through all three days of the festival. On Saturday I chanced upon a very passionate fan of his, an aspiring writer. As excited as I had been through the first two days, there were not many talks I was particularly interested in on the third day – Sunday. I had decided to spend a good amount of time inside the building behind Mysore Park, scouring through the various texts placed on tables and shelves for sale. There were plenty of volunteers in the form of college students present at the event. While most appeared to be running around and I was not entirely sure I wanted to bother them, the ones running the stall that sold crepes and waffles had time to have a quick chat. They were very friendly and seemed to enjoy conversing with their customers. One of them was also extremely excited about their homemade apple and cinnamon sauce and was very keen on getting customers to try it. “The festival has really taken off. The last time there weren’t as many people since it was the first time it was being organised. This year it’s much more planned, there are more people and right now it’s better than the Jaipur Literature festival in the sense that we have only the fans here, we don’t have people who come to a literature festival as a fad.” said a twenty two year old software engineer over a plate of chaat. At the end of the day, even as I had thoroughly enjoyed the festival, it was quite nice to have to face the final long journey from Electronic City, and as with the previous two days my mind was swimming with all that I had learned from the day’s experience. Bangalore Literature Festival will be held in Electronic City again. Read more to see what this year’s fest has to offer!